Stanford University scientists have developed an advanced zinc-air battery claimed to have higher catalytic activity and durability than similar batteries made with platinum and iridium catalysts. The results, published in Nature Communications, could lead to the development of a low-cost alternative to conventional lithium-ion batteries widely used today. According to Dai, most attention has focused on lithium-ion batteries, despite their limited energy density, high cost and safety problems. 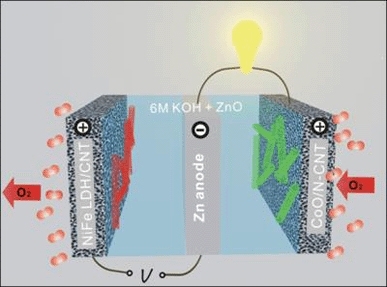 Zinc-air batteries combine atmospheric oxygen and zinc metal in a liquid alkaline electrolyte to generate electricity with a by-product of zinc oxide. When the process is reversed during recharging, oxygen and zinc metal are regenerated. Active and durable electrocatalysts on the air electrode are required to catalyse the oxygen-reduction reaction during discharge and the oxygen-evolution reaction during recharge. In zinc-air batteries, both catalytic reactions are sluggish, Dai said. Recently, his group has developed a number of high-performance electrocatalysts made with non-precious metal oxide or nanocrystals hybridised with carbon nanotubes. These catalysts produced higher catalytic activity and durability in alkaline electrolytes than catalysts made with platinum and other precious metals. The battery is also said to have demonstrated good reversibility and stability over long charge and discharge cycles over several weeks. ‘This work could be an important step toward developing practical rechargeable zinc-air batteries, even though other challenges relating to the zinc electrode and electrolyte remain to be solved,’ Dai added. I agree 100% that Zinc air batteries are the future. It is amazing to me how many people don’t realize that you have a totally closed up system with Li-Ion batteries thus limiting the energy density. If you can get a large portion of your energy from the air, than it is the way to go. However, I would like to see more effort on refueling station research rather than electrical recharging. I understand you can use solar oven to remove the oxide and return it to it’s charged form. US has the largest deposit of Zinc and the infrastructure is almost in place for refueling methods. Certainly zinc-air batteries have been around for a while as primary batteries – getting to secondary (rechargeable) would be a great step forward. One thing I have noted with zinc-air is that once the air flow has begun it is difficult to arrest the discharge so there might well be a significant self-discharge issue to overcome. Re. David Claxton’s point about air flow. Could you not shut off the air supply to the battery? Would this not slow the discharge?